IDOT is currently in the study phase of a decade-long project that will recreate both the boulevard and access to Lincoln Park. It will be years until IDOT has a refined design, so as a first step IDOT must identify what, exactly, they want to do — what they call a Purpose and Needs Statement for the project. Krause is on one of the project task forces, and helped bring to light that IDOT’s original objectives focused on personal vehicle congestion and traffic issues, and was blind to the road’s effects upon parks, the Lakefront Trail, and citywide mobility. Krause has crafted an alternative vision – one of two, the other by VOA Associates – to redesign the Drive [PDF]. He created it to start a broader conversation about not just how to rebuild a road, but instead to create a legacy project for Chicago that could reimagine both how people move along the lakefront, as well as the lakefront itself. The way the system is set up, the design team can’t discuss the project with the public, engineering firms are afraid to get involved for fear of being conflicted out of the future project, and the amateur general public is invited to give our unqualified opinions [at public meetings]. IDOT’s study approach started off by lamenting the delays and congestion drivers experienced, Krause says, and so was “propagating a [highway] status quo…that has been discredited for a long time. Great design often emerges through collaboration among people with complementary skills and viewpoints. In this case, maybe civil engineers, transit planners, urbanists, park designers,” and others could work together, rather than letting IDOT’s highway engineers run the show. Krause says Redefine the Drive needs to redefine the entire lakefront as well. It “needs some real headline attractions… new features that would show up on a tourist brochure of things to do in Chicago.” Or, more importantly, he says, “things that would get the mayor and Friends of the Parks to stand up to IDOT” and get them to do something other than “business as usual” highway-paving. 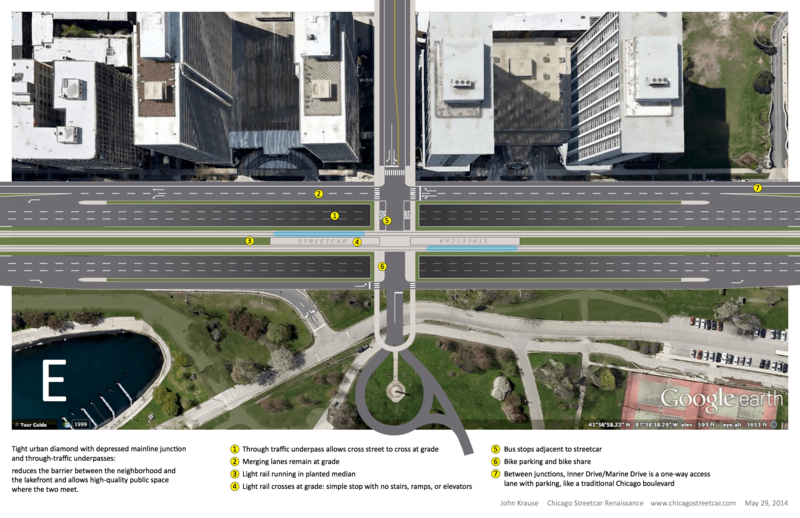 As an example of what broader thinking could bring to the Redefine the Drive process, Krause has illustrated his own conceptual idea of what the North Lake Shore Drive study area could become. His proposal divides the area, which reaches from Grand Avenue at Navy Pier on the south up to Hollywood Avenue on the north, into four sections. One principal component of Krause’s scheme is a light rail transit route down the center of the Drive, which would help meet the mobility needs of nearly 70,000 people each weekday. Stops would be spaced every 1/4 to 1/2 mile, including stops at the Peggy Notebaert Nature Museum, Lincoln Park Zoo, and Edgewater Sports Campus. Throughout his scheme, Krause suggests dipping the Drive below each interchange, removing the elevated bridges that block views towards the lake. The rail line would continue at grade, so that trains will align with bus stops and sidewalks at ground level. In the southernmost section, alongside Streeterville and the Gold Coast, Krause suggests several ways to breach the barrier that Lake Shore Drive forms as it curves around the area’s residential high-rises. For the Ohio and Oak Street beaches, he imagines “more restaurants and clubs, right on the beach,” as at Copacabana in Rio de Janeiro and other famed urban beaches. A shoreline extension would extend the beach north to Division Street. Today, the northern end of the Magnificent Mile empties out into a high-speed interchange and a small, rarely used park along East Lake Shore Drive. Krause’s design moves the Drive away from the Drake Hotel, opening up more space for a park, plaza, and restaurants. In the Lincoln Park section, from North Boulevard to Diversey Harbor, Krause moves the Drive to the west side of the lagoon to create a “Conservation Campus” around the Nature Museum and Zoo. Where the Drive is now would return to a “real Lake Michigan dune landscape, with camping.” Krause also adds interchanges at Diversey and Addison, to relieve traffic at Belmont. In the Lakeview section, between Belmont Harbor and Montrose Harbor, centers around a new Sheridan Square built atop a sunken Drive. Offshore, Krause proposes a quiet barrier island between Addison Street and Irving Park Road, accessible not by a bridge but only by swimmers and boaters. Daniel Burnham’s 1909 Plan of Chicago originally proposed a long series of such barrier islands, but only one (Northerly Island on the near South Side) was ever built. Krause admits that his proposals for park programming are incomplete, and in particular is open to suggestions for new activities at the Waveland golf and tennis complex. Krause suggests extensive changes in the northernmost section, between Montrose Avenue and Hollywood. There, he would eliminate the interchange at Wilson, which is a major conflict point between exiting drivers and the Lakefront Trail. Over near Cricket Hill, Krause proposes a parking structure, both to reduce the footprint of existing parking lots near Montrose beach and to allow commuters from further north to park and ride the light rail rather than continuing all the way downtown. Even though Krause and VOA have already floated proposals, Krause still feels that a design competition would stir up a broader-based public conversation about what the Drive could be. Next week, Streetsblog will examine VOA Associates’ proposal for the Near North lakefront, which was sponsored by the Lakefront Improvement Committee, Streeterville Organization of Active Residents, and Friends of the Parks. The people with the purse strings are employees of the people that put the money in the purse. They listen to their bosses – us. Like other good bosses, we just need to set clear expectations and hold our employees accountable for results. It’s mainly a residential street between the campus and station and the University provides buses as it is now from the station (and I can tell you that the residents of 57th Street will kill anything like a streetcar in ten seconds flat, especially since a State Senator lives on 57th Street). It might work better on 55th Street which is the main east-west artery in Hyde Park, but at the moment there really isn’t a need for a streetcar in Hyde Park. The Museum doesn’t need additional transit options since they have two bus routes right to their door (the 55 starts there and the dedicated 10 is express to and from downtown) and the 6 is across the street and Metra/South Shore trains are a block away. If money is to be spend on LRT it should be in underserved areas, not to superserve areas with decent transit. I don’t see a true immediate need for a streetcar on Cottage when there are areas with fewer rail options. Okay, thanks for the insight. I want to make it clear I am in favor of LRT, but it needs to serve underserved areas first, not the north Lakefront or U of C, or replace major arterial bus routes (see my comment on another thread with Western as an example). LRT along LSD will be seen, rightly in my opinion, as a gift to a wealthy elite along the lake while areas with NO rail access get no transit improvements. It’s kind of like the Grey Line Plan – all the money proposed in that for “improvements” could simply be spent increasing the service frequency with the existing infrastructure rather than wasting money on construction when what is already there can handle far more frequent trains, especially off peak, which is what the complaints about lack of service focus on. Once the density on the South Side increase LRT along cottage would be nice, but it might increase back to it’s previous levels of density or beyond which might make the ancient plans for subway/el extensions more useful, unfortunately, than LRT. But that’s a long way in the future. I’ve been trying to select the right mode for the circumstances, with the idea that the more cost-effective the whole is, the more service we can provide. So rail where ridership is high enough that it costs less than buses. Sometimes that calculus includes value capture revenue from property development, as would be the case on Cottage Grove. Extending heavy rail into the low-ridership periphery seems irresponsible to me, and so does using little buses stuck in traffic for the highest ridership routes through the most densely populated parts of our biggest cities. This approach may appear elitist because it puts rail where the demand for transit is highest, which often but not always coincides with where demand for property (and therefore property value) is highest. Bronzeville’s an example of a high-ridership area with mixed income that can become even more affordable if it grows complete enough for people to live well without a car. The reason to go to UofC isn’t because it’s underserved but because it’s the biggest employer on the south side. The MSI doesn’t need rail service, but it might be a good way to boost tourism–linking the Zoo, the Mag Mile, Millennium Park, the Loop, Motor Row and McCormick Place, the Obama Library, the DuSable Museum, and MSI all together on a single streetcar that tourists just love to ride. The same route will get Bronzeville to work in half the time it takes the #4, and may be a catalyst for enough local shopping and services that you don’t need to travel at all for the 5 out of 6 trips that are not to and from work. You have to keep in mind, that should a streetcar seriously be considered on LSD, the south side (and other parts of the city as well) will be very angry – they are already angry about the red line being closed, even temporarily, but more especially school closings, anger over which is widespread through the city, among other issues. I think the city is feeling more and more like a political powder keg than anytime I can remember recently, perhaps since Mayor Washington’s days. I’ve gotten the impression from friends in Bronzeville that they don’t necessarily want it to become more affordable, but more prosperous. Which I suppose dense development along Cottage would help. But I keep coming back to the fact that a lot of the city is underserved by rail and needs to get it, if only for fairness, but more importantly to improve access to jobs which aren’t necessarily downtown. Let’s just keep in mind that extending the L costs about ten times as much per mile as streetcar, and we don’t have any extra money lying around. So let’s use it wisely and buy as much service, as much fairness, as much access to jobs as we can for those neighborhoods. I still don’t see why we need a “streetcar” shaped service with new dedicated cars. Why not another (surface-running, if necessary) El line using the same cars all the other lines use? It will be much easier to use the same mechanics to maintain all of them, and the same pool of drivers trained on exactly the same equipment. Adding a new standard to the mix is incredibly wasteful, and brings little to no benefit except in the cosmetic sense, which is minimal. Tourists would still ride it if it looked like an El train. Because the L costs about ten times as much per mile to build heavy rail, and it’s not safe to run in the street, where we need it, so it ends going in remote abandoned freight corridors. Do you have anything that explains it in text/pictures? The bandwidth for video is insane, and I absorb info badly from video anyway. I still don’t see what the advantage of running IN a street is, anyway — it invites cars and other nearby folks to interfere in the right-of-way in ways that having a fully separated place to run doesn’t. In Toronto, for example, the streetcars are always getting hung up behind idiots who insist on driving in or turning through the streetcar’s way and being unable to get OUT of the way in a timely fashion. That’s not better than a bus getting stuck in traffic all the time, for the commuters on the streetcar, anyway. Got somewhere with fast wifi and watched it — that looks like a commuter nightmare to me. You really wouldn’t want to go faster than 20-25mph with it, with pedestrians wandering around in the ROW — which is not faster than busses. To make a real difference to travel times in Chicago, rail has to be able to get up to 40mph+ between stations, and that’s an insane deathtrap if pedestrians are allowed to wander around on the tracks. That’s great for scenic silly tourism purposes (like the mini-train that goes around a zoo for sight-seeing), but it’s not serious transit. Elliott, this is the way the modern world does serious transit these days. It’s only scenic silly tourism in the United States. Just look around the internet for tramways. You won’t find any getting stuck in traffic with cars, and you won’t find any with much slower average speed than the L. That tramway in the video gets 9700 boardings per mile, which is more than three times as many per mile as the average L line in Chicago, but it costs a small fraction as much to build. They slow down on pedestrian shopping streets, but then they’re right there in the street instead of three blocks away and two stories underground. There are situations where you want a train to go faster than a modern tramway and stop less frequently and have higher capacity, and where you’re willing to spend a billion dollars a mile for a subway. I just don’t think we have any more places like that now in Chicago. But the real reason Strasbourg invested in a 35-mile network of tramways (even though they only have 280,000 people) is because it completely transformed the character of the city’s streets, turning them into world-class public spaces. It’s much more than just a transit system: it makes the city a great place to live and work. These days the things that dramatically enhance the quality of life in a city also work as catalysts for economic growth. Let’s keep in mind that it’s a competitive environment and we’re the only big city in America that’s not expanding our transit system. I still don’t see it. Shared right-of-way will inevitably lead to conflicts. But we don’t really have any for LRT either, unfortunately. Thinking about this over the weekend, a better routing for LRT on cottage would be to continue south past 63rd Street to connect with the el and then head west over to King Drive south to Chicago State and then over to the Red Line and the Plaza. I’ve heard that was a problem in Chicago as well with streetcars blocked by double-parked cars. The rendering of the intersection of Addison and Lake Shore above looks like an atrocious mess creating gridlock and pollution from people driving around on the one way streets. I’m also not sure that the Park District can just sell off or develop parkland legally (i.e. Clarendon Park) without changing their charter – I realize I’m injecting practicality into the equation. Heavy rail in a highway median won’t work well. The crossing requirements are different than LRT would be. The ROW along 71st Street and south through South Shore isn’t the worlds most attractive as it is now (it could be a lot better than it is, admittedly). Plus the bi-level cars on Metra would require extra tall overpasses and underpasses and very long platforms for up to eight cars (and the required audible warnings at stations would drive LSD residents bonkers). It would make more sense to connect to one of the north lines underground from Randolph via Union in tandem with electrification of those lines. My point is to only build LRT where the ridership is high enough to make it the most cost-effective choice. I don’t know the corridor you suggest well enough, but I believe it’s an area of moderate and declining density, and King Drive is too close to the Red Line. We’re looking for routes that are relatively short with high ridership the whole way. The other thing we need to consider is that we want to avoid forcing people to transfer as much as possible. The best point to transition from bus to rail on Cottage may be the UofC Medical Center because so many get on and off there–coming by streetcar from the north and bus from the south. Let’s keep looking for routes that best serve the interests of both equity and economy, since we’re short on both. Unfortunately, as American politics since Reagan has demonstrated again and again, you don’t need to fool all the people all of the time–you need only fool enough of the people enough of the time. Chicago has not had streetcars in my lifetime (I am nearly 40). A lot of people who live along King Drive, Cottage and other N-S streets take the bus all the way downtown rather than heading over to the red line, particularly when the express buses were running, so this might be more heavily used than the density implies. A streetcar would absolutely need to connect to the Green Line terminal at 63rd. A Hyde Park to Midway line would also be heavily used (the 55 is often crush loaded between Western and the Dan Ryan). I think it could also stimulate a lot of economic development as well. Agreed about ridership in the Cottage Grove corridor. The #4 is the eighth busiest route per mile in the whole system (Ashland is only 14th). Can you say more about connecting to the Green Line at 63rd? Why would anyone go south on the streetcar in order to go north on the L? The MPC proposed a BRT route on Garfield Blvd between Hyde Park and Midway. I’m not sure there’s enough ridership for streetcar. We’ve been looking at a potential ring route that includes Garfield, but I’m not ready to talk about that one yet. I still think an El line like all the others is the best, simplest, most sustainable solution. You are a senile old coot, whose ideas cannot possibly be taken seriously. It is well know that FED monetary policy is not producing growth, just a smoother business circle. The day FED fiscal policy in corporation with private equity, will engage on investment projects such as better/faster/longer transport, the new north LSDr and landscape will come true.